The Gilgal is the Israeli Stonehenge. 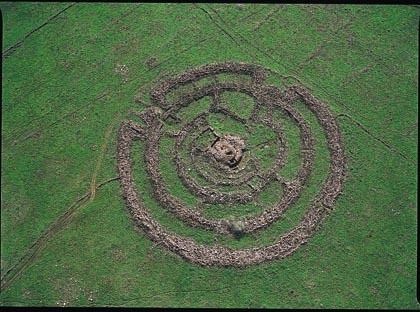 The structure is composed of over 40,000 stones that are arranged in 4 circles. It is quite big – the diameter of the outer circle is about 150 meters/490 feet. The site is estimated to be 5,000 years old. Og, according to the Holy Bible, was an Amorite king of Bashan who, along with his army, was slain by Moses and his men at the battle of Edrei. Og is mentioned in Jewish folklore as being alive from the time of Noah up until the time of his death in battle with the Israelites. It is also written in the Midrash that he had a special compartment in Noah’s Ark just for him. Aggadah suggests an alternative to this; that he sat upon the top of the ark, riding out the flood for the duration of the storm from this location. God clearly stated, “For in seven days I will send rain on the earth forty days and forty nights, and every living thing that I have made I will blot out from the face of the ground” (Genesis 7:4). When studying the Sons of God and the Nephilim, it is apparent that “Nephilim were on the earth before the flood, and also afterward. (Genesis 6:4). GotQuestions: Who / what were the Nephilim? GotQuestions: Who were the sons of God and daughter of men in Genesis 6:1-4? The Holy Bible is silent on how the Sons of God were established after the flood. Many apocryphal books and commentaries deal with this question, I will not however, as I do not believe speculation should be included in any serious Bible study. Og is introduced in the Book of Numbers. Like his neighbor Sihon of Heshbon, whom Moses had previously conquered at the battle of Jahaz he was an Amorite king, the ruler of Bashan, which contained sixty walled cities and many unwalled towns, with his capital at Ashtaroth where there still exists a 70-foot mound. Th Book of Deuteronomy says, “Then we turned and went up the way to Bashan. And Og the king of Bashan came out against us, he and all his people, to battle at Edrei. But the LORD said to me, ‘Do not fear him, for I have given him and all his people and his land into your hand. And you shall do to him as you did to Sihon the king of the Amorites, who lived at Heshbon.’ So the LORD our God gave into our hand Og also, the king of Bashan, and all his people, and we struck him down until he had no survivor left. And we took all his cities at that time–there was not a city that we did not take from them–sixty cities, the whole region of Argob, the kingdom of Og in Bashan. All these were cities fortified with high walls, gates, and bars, besides very many unwalled villages. And we devoted them to destruction, as we did to Sihon the king of Heshbon, devoting to destruction every city, men, women, and children. But all the livestock and the spoil of the cities we took as our plunder” (Deuteronomy 3:1-7 ESV). Og’s destruction is told in Psalms 135:8-12 and 136:2-22 as one of many great victories for the nation of Israel, and the Book of Amos 2:9-10 may refer to Og as “the Amorite” whose height was like the height of the cedars and whose strength was like the oaks. He it was who struck down the firstborn of Egypt, both of man and of beast; who in your midst, O Egypt, sent signs and wonders against Pharaoh and all his servants; who struck down many nations and killed mighty kings, Sihon, king of the Amorites, and Og, king of Bashan, and all the kingdoms of Canaan, and gave their land as a heritage, a heritage to his people Israel. Give thanks to the God of gods, for his steadfast love endures forever. Give thanks to the Lord of lords, for his steadfast love endures forever; to him who alone does great wonders, for his steadfast love endures forever; to him who by understanding made the heavens, for his steadfast love endures forever; to him who spread out the earth above the waters, for his steadfast love endures forever; to him who made the great lights, for his steadfast love endures forever; the sun to rule over the day, for his steadfast love endures forever; the moon and stars to rule over the night, for his steadfast love endures forever; to him who struck down the firstborn of Egypt, for his steadfast love endures forever; and brought Israel out from among them, for his steadfast love endures forever; with a strong hand and an outstretched arm, for his steadfast love endures forever; to him who divided the Red Sea in two, for his steadfast love endures forever; and made Israel pass through the midst of it, for his steadfast love endures forever; but overthrew Pharaoh and his host in the Red Sea, for his steadfast love endures forever; to him who led his people through the wilderness, for his steadfast love endures forever; to him who struck down great kings, for his steadfast love endures forever; and killed mighty kings, for his steadfast love endures forever; Sihon, king of the Amorites, for his steadfast love endures forever; and Og, king of Bashan, for his steadfast love endures forever; and gave their land as a heritage, for his steadfast love endures forever; a heritage to Israel his servant, for his steadfast love endures forever. “Yet it was I who destroyed the Amorite before them, whose height was like the height of the cedars and who was as strong as the oaks; I destroyed his fruit above and his roots beneath. Also it was I who brought you up out of the land of Egypt and led you forty years in the wilderness, to possess the land of the Amorite. Now these are the kings of the land whom the people of Israel defeated and took possession of their land beyond the Jordan toward the sunrise, from the Valley of the Arnon to Mount Hermon, with all the Arabah eastward: Sihon king of the Amorites who lived at Heshbon and ruled from Aroer, which is on the edge of the Valley of the Arnon, and from the middle of the valley as far as the river Jabbok, the boundary of the Ammonites, that is, half of Gilead, and the Arabah to the Sea of Chinneroth eastward, and in the direction of Beth-jeshimoth, to the Sea of the Arabah, the Salt Sea, southward to the foot of the slopes of Pisgah; and Og king of Bashan, one of the remnant of the Rephaim, who lived at Ashtaroth and at Edrei and ruled over Mount Hermon and Salecah and all Bashan to the boundary of the Geshurites and the Maacathites, and over half of Gilead to the boundary of Sihon king of Heshbon. Now Joshua was old and advanced in years, and the LORD said to him, “You are old and advanced in years, and there remains yet very much land to possess. This is the land that yet remains: all the regions of the Philistines, and all those of the Geshurites (from the Shihor, which is east of Egypt, northward to the boundary of Ekron, it is counted as Canaanite; there are five rulers of the Philistines, those of Gaza, Ashdod, Ashkelon, Gath, and Ekron), and those of the Avvim, in the south, all the land of the Canaanites, and Mearah that belongs to the Sidonians, to Aphek, to the boundary of the Amorites, and the land of the Gebalites, and all Lebanon, toward the sunrise, from Baal-gad below Mount Hermon to Lebo-hamath, all the inhabitants of the hill country from Lebanon to Misrephoth-maim, even all the Sidonians. I myself will drive them out from before the people of Israel. Only allot the land to Israel for an inheritance, as I have commanded you. Now therefore divide this land for an inheritance to the nine tribes and half the tribe of Manasseh.” With the other half of the tribe of Manasseh the Reubenites and the Gadites received their inheritance, which Moses gave them, beyond the Jordan eastward, as Moses the servant of the LORD gave them: from Aroer, which is on the edge of the Valley of the Arnon, and the city that is in the middle of the valley, and all the tableland of Medeba as far as Dibon; and all the cities of Sihon king of the Amorites, who reigned in Heshbon, as far as the boundary of the Ammonites; and Gilead, and the region of the Geshurites and Maacathites, and all Mount Hermon, and all Bashan to Salecah; all the kingdom of Og in Bashan, who reigned in Ashtaroth and in Edrei (he alone was left of the remnant of the Rephaim); these Moses had struck and driven out. A possible connection can also be made with the much older Ugaritic text KTU 1.108, which uses the term “king” in association with the root /rp/ or “Rapah” (the Rephaim of the Bible) and geographic place names that probably correspond to the cities of Ashtaroth and Edrei in the Holy Bible, and with which king Og is clearly associated (Deuteronomy 1:4; Joshua 9:10; 12:4; 13:12, 31). In the fortieth year, on the first day of the eleventh month, Moses spoke to the people of Israel according to all that the LORD had given him in commandment to them, after he had defeated Sihon the king of the Amorites, who lived in Heshbon, and Og the king of Bashan, who lived in Ashtaroth and in Edrei. They said to Joshua, “We are your servants.” And Joshua said to them, “Who are you? And where do you come from?” They said to him, “From a very distant country your servants have come, because of the name of the LORD your God. For we have heard a report of him, and all that he did in Egypt, and all that he did to the two kings of the Amorites who were beyond the Jordan, to Sihon the king of Heshbon, and to Og king of Bashan, who lived in Ashtaroth. Now therefore divide this land for an inheritance to the nine tribes and half the tribe of Manasseh.” With the other half of the tribe of Manasseh the Reubenites and the Gadites received their inheritance, which Moses gave them, beyond the Jordan eastward, as Moses the servant of the LORD gave them: from Aroer, which is on the edge of the Valley of the Arnon, and the city that is in the middle of the valley, and all the tableland of Medeba as far as Dibon; and all the cities of Sihon king of the Amorites, who reigned in Heshbon, as far as the boundary of the Ammonites; and Gilead, and the region of the Geshurites and Maacathites, and all Mount Hermon, and all Bashan to Salecah; all the kingdom of Og in Bashan, who reigned in Ashtaroth and in Edrei (he alone was left of the remnant of the Rephaim); these Moses had struck and driven out. Their region extended from Mahanaim, through all Bashan, the whole kingdom of Og king of Bashan, and all the towns of Jair, which are in Bashan, sixty cities, and half Gilead, and Ashtaroth, and Edrei, the cities of the kingdom of Og in Bashan. These were allotted to the people of Machir the son of Manasseh for the half of the people of Machir according to their clans. The 2nd century BC apocryphal book “Ogias the Giant” or “The Book of Giants” depicts the adventures of a giant named Ogias who fought a great dragon, and who was supposedly either identical with the Biblical Og or was Og’s father. The book enjoyed considerable currency for several centuries, especially due to having been taken up by the Manichaean religion.